The mythical Leda was seduced by Jupiter in the form of a swan. Leonardo worked on two compositions of the subject, finally executing a painting that was destroyed in the eighteenth century. In the four surviving studies of Leda's head, Leonardo expended little effort on her expression, simply adopting the usual downward glance. 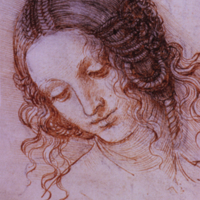 Instead Leonardo devoted all his attention to the most complicated of hairstyles, with dense whorls and woven plaits, even studying the head from the back - quite unnecessarily for a painted image. Windsor Castle (Windsor, England, United Kingdom) RL 12518; Royal Library. Bequeathed to Francesco Melzi; probably acquired by Charles II; in the Royal Collection by 1690. 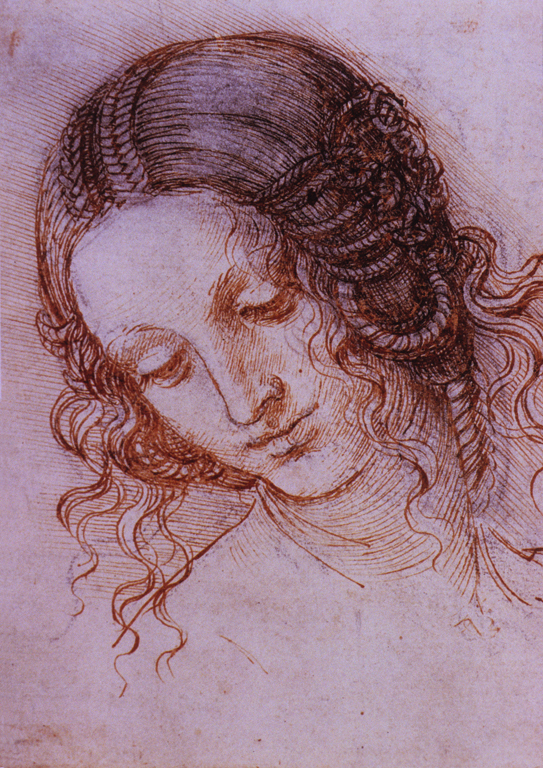 Leonardo da Vinci (Italian artist, 1452-1519), “Study for the Head of Leda,” Institute Images Online, accessed April 24, 2019, http://westerncivart.com/items/show/2940.